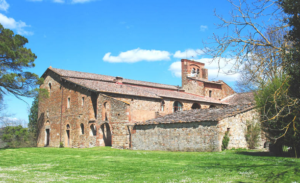 Already vallombrosan Monastery founded in the 11th century by the counts of Miller, was suppressed by Pope Pius II in 1462. Of Romanesque architecture with elements of Lombard and French artistic culture is currently much altered. Originally the building was reduced to a three-nave and apse, now missing. The courtyard overlooking a loggia and a portico. Stands the Bell Tower with mullioned Windows on steering columns and capitals. Under the presbytery is the crypt of the twelfth century, access to which is to the right of the main altar, which was originally formed by seven small aisles.